Fore- and hindcasts of meso-scale temperature-anomalies in the region of the Scandinavian mountain ridge. Based on the forecasts the FALCON will search lee-wave or synoptic PSCs and perform airborne lidar measurements of particle backscatter within the PSCs as well as up up- and downwind ozone. The OLEX Lidar will act as a PSC-pathfinder in order to guide the in-situ measuring ER-2 aircraft. Therefore real time information of PSC position will be supplied during the flight missions. This means close co-ordination with ER-2. Immediate feed-back from- and close collaboration with modellers (ETHZ, Univ. Leeds,...) during campaign and afterwards. Contour Advection simulations, validated by the long 2D-sections of ozone and aerosol as vortex air tracers, will serve to investigate the formation and erosion of filaments as well as dynamical exchange processes in the lowermost vortex. 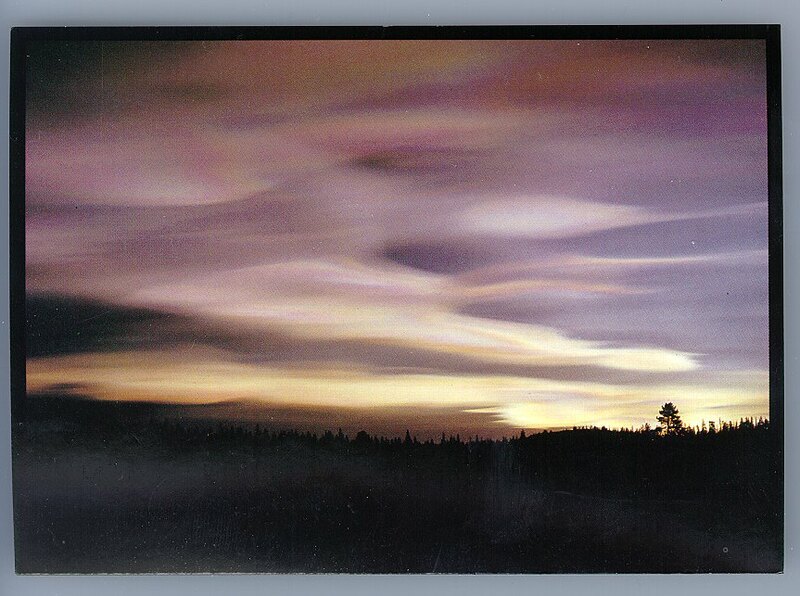 Aircraft campaign from 22.01.2000 - 04.02.2000 from Kiruna (North-Sweden). 16 flight hours during campaign + 2 transfers (OP-Kiruna-OP = 8 flight-hours). The upward pointing aerosol-ozone-lidar (OLEX) makes use of a Nd:YAG laser emitting at 1064 nm and a XeCl-excimer laser emitting 308 nm for the ozone measurement with the DIAL technique. Frequency doubling and tripling of the Nd:YAG basic wavelength provides 532 nm and 355 nm channels. The received 532 nm signal is split into the perpendicularly polarised portions to determine the depolarisation ratio. With a repetition rate of 10 Hz for typical aircraft speed of 180 m/s the raw data resolution is about 18 m horizontally. Vertically the ADC sampling rate results in a resolution of 15 m. However, the compromise between signal/noise ratio and resolution leads to a processed resolution of about 1 km horizontally and 30 m vertically for the processed data. The receiving Cassegrain telescope (r = 17.5 cm) has 1 mrad field of view. 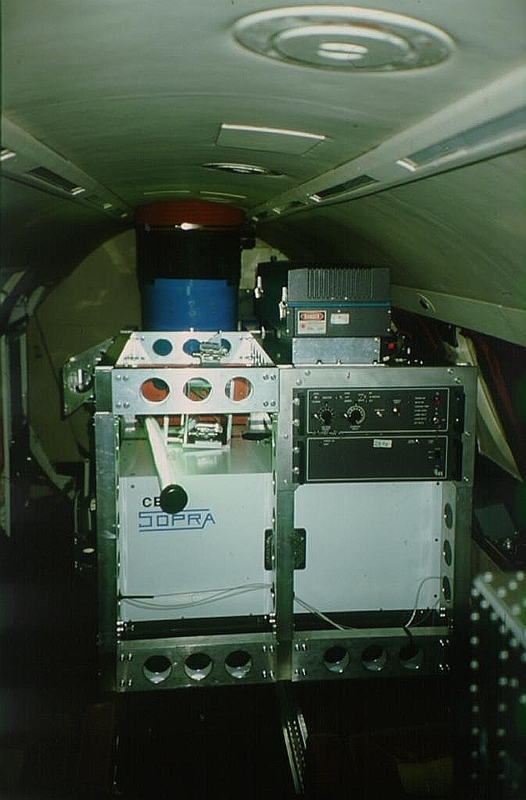 Biaxial optical system and beam path of the ALEX lidar. Left side: transmitter and crystals for frequency conversion, right side: receiver and data acquisition system. The system parameters are listed in Table 3. Full overlap of the laser beam and the receiver field-of-view is achieved after a distance of about 1 - 1.5 km. 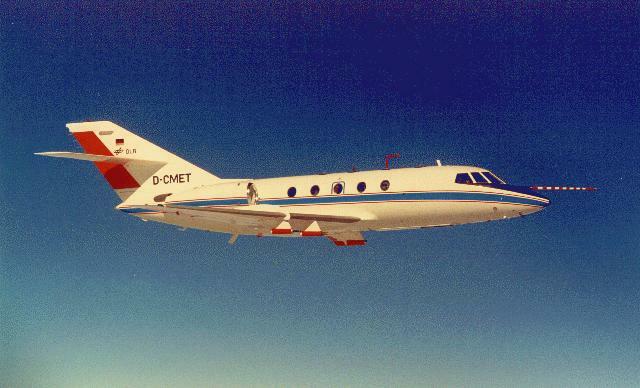 View of the OLEX Lidar onboard the German Falcon aircraft D-CMET in flight direction. Front: XeCl-excimer laser, back: upward pointing telescope (blue), upper right side: Nd:YAG-laser.